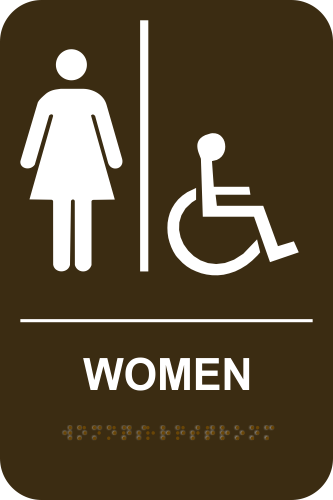 6"x9" ADA compliant stock Women's Handicap Accessible Restroom sign in brown with white tactile letters and symbols, brown braille. Custom Text Handicap Parking Sign | 18" x 12"
This Women's Handicap Accessible sign makes it easy to meet ADA guidelines. Replace or upgrade older signs and ensure ADA compliance. This brown sign is 6" wide by 9" tall and features rounded corners and pictograms. Braille and the raised symbols and letters are molded into the sign making them all one piece and not able to be picked or peeled off.